BAKERSFIELD, Calif. — A suspect believed to have been involved in the death of an hours-old baby has bailed out of jail. Initially, BPD reported that 47-year-old Jagsir Singh was arrested in connection with an investigation into the death of the baby for aiding a felon, felony child abuse, and conspiracy. However, jail records show Singh was booked on charges of willful cruelty to a child, accessory and conspiring to commit a crime. 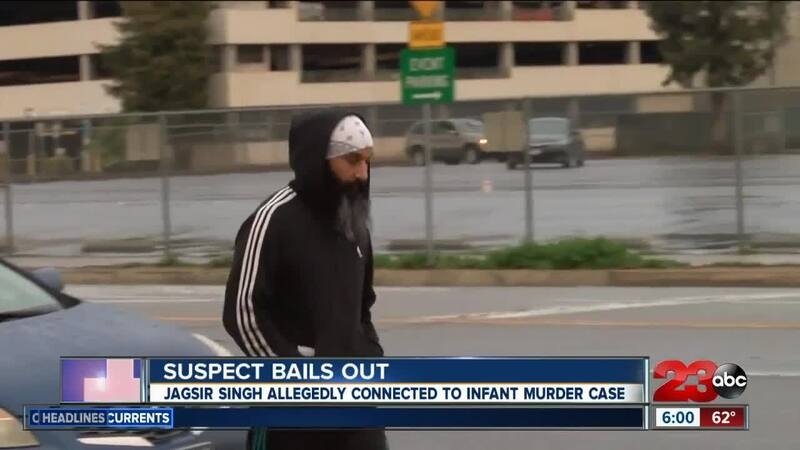 According to the Kern County Central Receiving facility, where Jagsir Singh was being held, Singh has posted bail and was released Wednesday, February 27. On Tuesday, February 26, BPD responded to a residence in the 5200 block of Shining Crag Avenue in Southwest Bakersfield for a possible homicide. BPD says the investigation revealed that a juvenile gave birth to a live baby boy at the residence in November of 2018. Within hours of the birth, BPD says 43-year-old Beant Kaur Dhillon took the baby and allegedly murdered him at the residence. Dhillon is scheduled to be in court today, February 28, at 3 p.m. Singh is scheduled to be in court March 13 at 8 a.m. The investigation is ongoing. Anyone with information regarding this case is encouraged to call Detective Littlefield (661) 326-3558 or the Bakersfield Police Department at (661) 327-7111.